Last year, my oldest daughter, Annalee, did an exhibition project about the epidemic of homelessness in New York State. She and her group of classmates focused specifically on the bulldozing of Tent City here in Rochester, which displaced countless homeless people from the only safe haven they knew at the time. Annalee (age 10 at the time) and her group came up with the idea of collecting blankets for the displaced homeless population. The blankets were then donated to an organization that was temporarily housing those whose tents were bulldozed by the city of Rochester. The whole thing was handled terribly and the treatment of the residents of Tent City was deplorable in my opinion. The small box of blankets was one fifth grader's way of showing compassion. 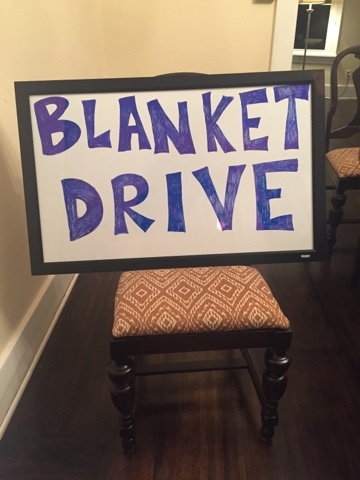 For Day 26, I am inspired by my daughter's efforts and have continued them with our own neighborhood blanket drive. I posted the information on our neighborhood Facebook page and will keep this obnoxious sign and a bin in my front yard for the next week. All blankets and/or sleeping bags will be donated to local missions and shelters who provide services for the homeless men, women and children in our community. If you live in the Rochester area and would like to donate, send me a private message and if I determine that you are not a creepy pervert, I will give you my address to collect your donation. Most of us have more than we need, just in general, but blankets and sleeping bags are some of those things that mean nothing to us when they are stored away in a linen closet - but could literally save someone's life in the harsh, record-breaking, farmer's-almanac-cursing, Rochester winter we will undoubtedly have for the zillionth year in a row.